I did a personal ATC swap with the amazing Gozer. She made me some seriously awesome cards, and I sent her some kitties/bunnies themed cards. 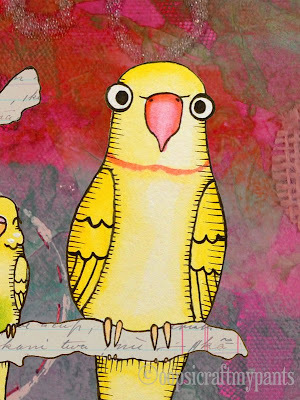 This one is watercolor and ink. Originally, I was going to leave the background kitties black and white, but there just wasn't enough color for me. This one is a bunnies-themed mixed media card. Postage stamps, paint, regular stamps, pigment powder, etc. Learn to sew a bag! "A Bag for All Reasons" book giveaway is still happening. Go comment to enter! GIVEAWAY! Want to learn to sew a bag? "A Bag For All Reasons" Book Giveaway! Why hello, my friends, on this lovely Tuesday! I have a giveaway for you guys. 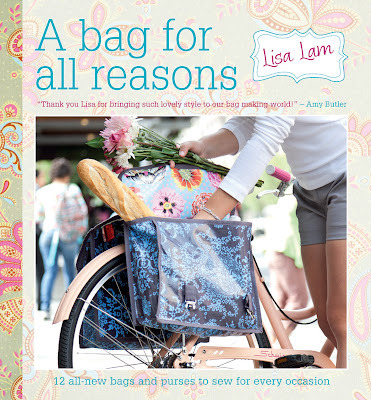 The kind folks over at Martha Pullen Company sent me a copy of Lisa Lam's "A Bag For All Reasons" to review and also offered to give a copy away to one of my readers. I decided to try making the Compact Groceries Tote (thanks, Mindy, for the fabric! ), since I'm constantly bringing packages to the post office. I was using a different bag, and just crumpling it up and throwing it back in my car once it was empty. What I like about this one is that it has a wrap around strap to fold up the bag and a clippy on it so I can attach it to my other bag, instead of just tossing it in the car willy-nilly. I like this bag a lot, and have actually been using it as my purse for the past few days. I can snap the wrap-around snap together and clip my keys onto it, which is cool, because I am always losing my keys. Making the bag from the instructions in the book was pretty easy, and I didn't need to think too hard. Whenever I try to just sew a bag from scratch out of my head, I end up seam-ripping and having to think real hard. It was nice to have clear instructions to follow step by step. Also, there are full-size pull-out patterns in the back of the book, so you don't have to make your own out of tissue or whatever. I liked that a LOT. The only thing I had trouble with was the envelope-style bottom, but that was just me being crazy. Anyway, I really like this book, and I'm not just saying that. The pull-out patterns: awesome. The book is spiral-bound, so it lays flat when you're working: awesome. And all the projects in the book (there are 12) are all really cute and functional and not too intimidating. So! Do you waaaaant a copy? :) You should. This giveaway is open to folks in the US, Canada, and Europe. You can enter two ways: comment here and/or on the giveaway photo on my Facebook page. Please only comment once per place. I'll pick a random winner on Monday November 12th. And guess what ELSE?! If you want to make a compact groceries tote for yourself, you can find the whole project tutorial and pattern here. http://www.sccmag.com/bag-for-all-reasons/. I can't remember if I ever told you guys about Jxh0703's YouTube videos, and if I did, it was probably one of Bowie, the indian ringneck. 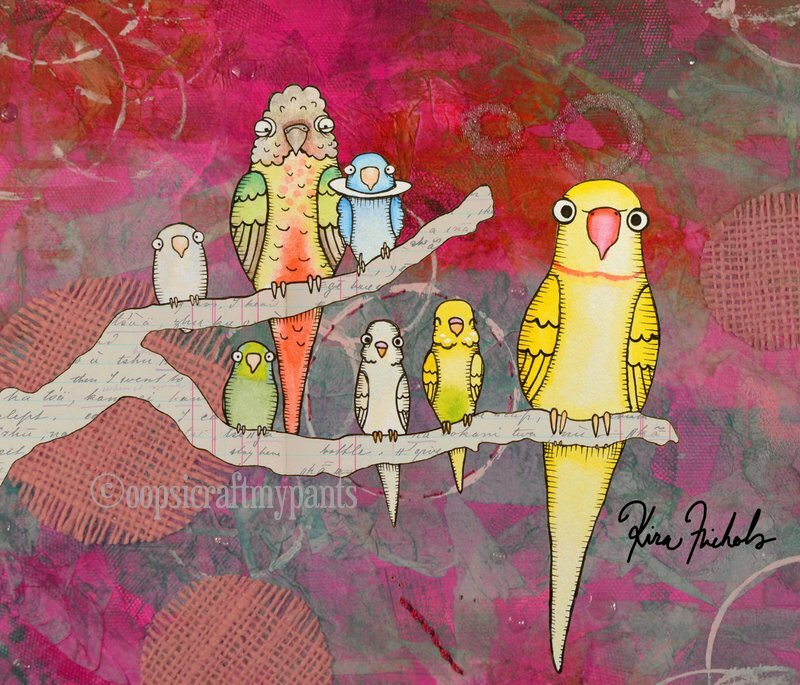 Anyway, she has this adorable flock of various parrots, and they are all super cute and I love to watch them. 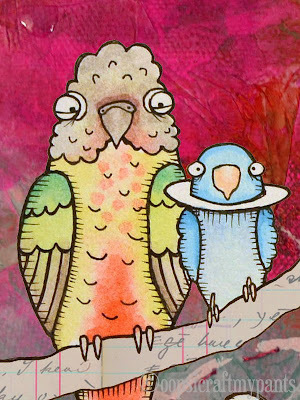 I have been wanting to do some fan art for a while, because for some reason, I just really like these birds! I finally got to it last night. Top branch L-R: Smokey, Hazel, Boo-boo. Low branch L-R: Kool-aid, Wish, Bee, and Bowie. 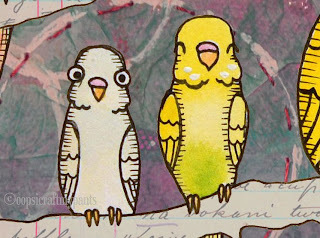 Well, I hope you liked my weird post, telling you all about vague celebrity birds that I've never met. LOL. It's still creeping up on all of us... Halloween! Here's a crazy-looking black cat plaque I made for a Halloween swap on Craftster. My partner got it, so now I can share without spoiling any surprises. The theme for the swap was "Vintage/Retro Halloween." I'm not sure how vintage-looking this turned out, but it was vintage inspired. Here's a pic of the cat before painting. I used polyclay and modeled it after an old 1930s (I think?) embossed die-cut Halloween decoration. The proportions aren't exact, so it looks a little different, but I was happy with how it turned out. Here's the cat after baking and painting, before distressing. I just used acrylics. I roughed it up after painting with some sandpaper and brownish-gray pigment ink. 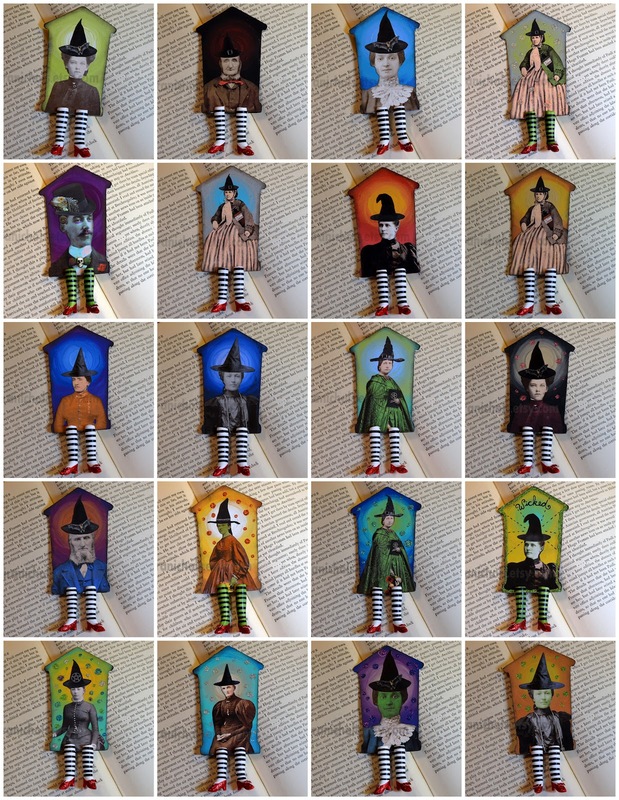 I have been hard at work making Wicked Witch/Ruby Slippers bookmarks to stock my shop for this very witchy and spooky month of Halloween :) There are 20 new ones for sale in my Wicked Awesome Series, including a few with green shimmery striped legs...Very Elphaba! Please check them out, or share with a friend. 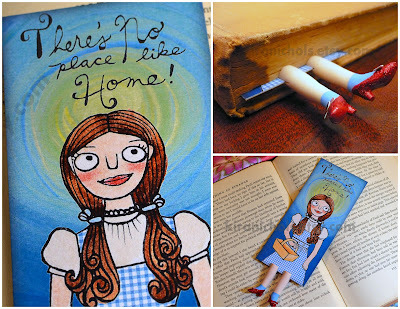 I also have had plenty of people ask me if I make Dorothy, too, so I thought, "Why not?" 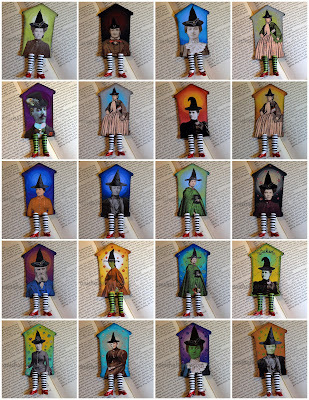 and went ahead and made some Dorothy Bookmarks. The bookmark body features an original illustration, which I made by drawing, watercoloring, acrylic painting, then combining the various elements digitally, including the blue gingham dress :) I was pretty happy with my Dorothy! Anyhoo, I hope everybody has been having a good week so far. It's October 1st! That means a new Challenge at the Unique Crafters Challenge Blog. This month's theme: HALLOWEEN! I made this haunted house card using some Stampotique stamps which are perfect for this spooky holiday. Plus, some crazy bats shooting out of the top with wire, because what's a haunted house without bats? Octobers Halloween themed challenge is being sponsored by two generous businesses so we will have two prize winners for the challenge. The best scrapbook page will receive a $25 dollar prize pack of craft supplies from Crafty Crops and the best card or altered art project will receive a free $10.00 gift certificate to the new Cedar Chest Designs digital website. So, goblins, get out your creepy gluesticks and scary glitter, and enter our Halloween challenge at Unique Crafters! Digital stamps and pattern paper for the craft world. Crafty Crops - Start a Party! Craft with Friends! The portable scrapbook store for craft parties and fundraisers.